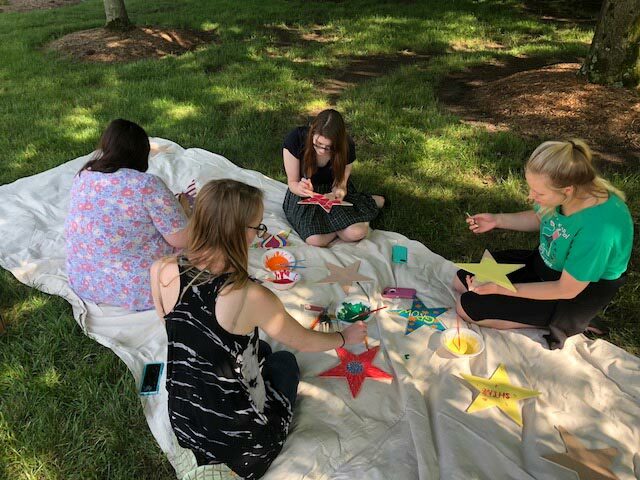 Graduate art therapy students paint wooden stars for Noblesville survivors while on-campus for residency on June 13. These were the words by Martin Luther King, Jr., painted on a wooden star especially picked out by Saint Mary-of-the-Woods College (SMWC) graduate students Naomi Nothdurft-Moeller, Tracy Reff and Ginger Mote. It was one of the stars the trio selected to give to two survivors of a recent school shooting in Indiana. “All three of us … felt that this star definitely needed to go to one of the survivors. The healing message of hope from one of our country’s most influential leaders still holds relevance today,” Nothdurft-Moeller said. Nothdurft-Moeller, a resident of South Bend, Reff of Valparaiso, and Mote of Kokomo found themselves in Noblesville last week hanging 200 individually-painted stars at a local park ahead of a fundraiser for the victims of the May 25 shooting at Noblesville West Middle School. They selected 10 more to be set aside for the survivors. With every stroke of paint on every wooden star, the graduate students in the Master of Arts in Art Therapy (MAAT) program sought to bring hope to the traumatized community. Stars of Hope: MAAT students deliver and hang a total of 210 stars at Federal Hill Commons park for Miller Fest, a benefit for the victims of the Noblesville West Middle School shooting. The stars were painted by volunteers from four U.S. states. The students worked with non-profit organization Stars of HOPE to bring support to the people of Noblesville. This effort sprung from a connection made between Nothdurft-Moeller and 2017 SMWC graduate Stephanie Wray through MAAT’s Facebook community. Wray, who currently works as a corporate art therapy consultant at the non-profit organization Stars of HOPE, called for volunteers on Facebook in the days following the shooting. Nothdurft-Moeller responded. 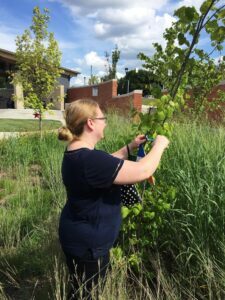 Soon, she found herself collecting stars from New York, Texas and California (sent to her through Stars of HOPE), coordinating with the Noblesville Parks and Recreation Department about where they should go and assembling her peers to help with the effort. She even spent her own birthday money to purchase stars her classmates painted during a recent on-campus residency weekend. 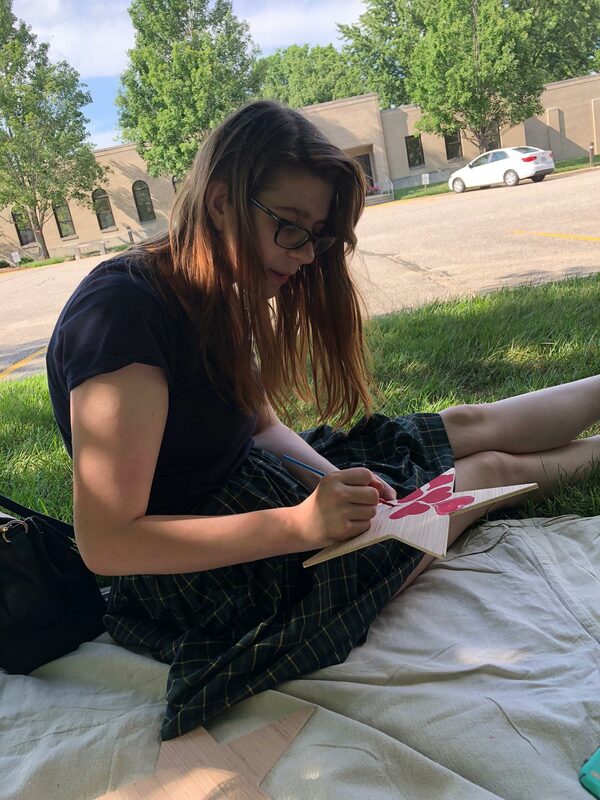 MAAT student Kelly McEwen paints hearts on a star to show her support of the survivors of the May 25 Noblesville school shooting. She joins her classmates for the painting event on the campus of Saint Mary-of-the-Woods College. Graduate Student Ginger Mote hangs a Star of HOPE on one of the trees at Federal Hill Commons ahead of July 17’s Miller Fest, a fundraiser for survivors of the Noblesville school shooting. Of the total 210 stars the Noblesville community saw at the Miller Fest benefit on July 17, a dozen was painted by MAAT students. During the campus painting event, Indianapolis resident Kelly McEwen painted red hearts on her star to express her support for Noblesville. She hopes those who see the star will feel love, happiness and a sense of community. 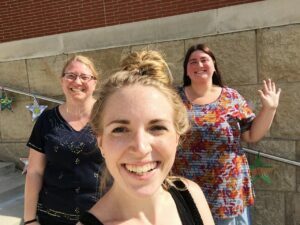 MAAT students Ginger Mote, Naomi Nothdurft-Moeller and Tracy Reff celebrate after hanging 200 Stars of HOPE on July 17 in Noblesville. Wray said as “person on the ground,” Nothdurft-Moeller definitely took on a big job in coordinating the effort. She praised her initiative and passion, and was pleased to have been able to mentor an MAAT student. Because networking and mentorship are really important in the field of art therapy, she treasures her connection with and reliance on her MAAT family from all over the country, she said. Wray added she is thankful for the opportunities presented in her graduate program that allowed her to become involved with Stars of HOPE as a student; this is work she’s been able to continue after graduation. Now, she is paying it forward. “It’s very important for students to understand how much of a difference they can make right now,” Wray said. It’s about empowerment, a valuable gift that comes from The Woods to its students. “When I first met my MAAT graduate cohort, I knew that someday we would help impact communities through art therapy,” Nothdurft-Moeller said. Wonderful healing power in art. A valuable resource for all of us struggling to cope.